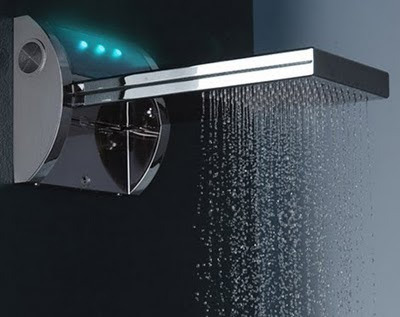 Take your iPod into the shower with you with this new MP3 Shower Head from Italian company Bossini. 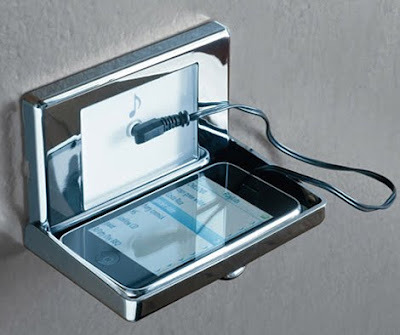 The Aquavolo Music-Chromotherapy (it’s refreshing to have an iPod accessory that doesn’t just stick an “i” in front the name, right?) combines a stainless steel two way shower head (waterfall or rain) with a complete sound system. There are two speakers and a nice spot to hook up your player: I’m going to assume that little shelf needs to be pretty far away from the water to keep your player dry. Looks like a typical Italian bathroom design- sleek, modern, minimal and elegant. You can’t value engineer that.